The Russians Are Coming? Whoa! Who’s that in my video cam lookin’ down on me? After learning Jesse Ventura, Reform Party upstart, won the election for governor in Minnesota, he was asked by the CIA: “How did you win?”. Well, they’re keepin’ on and keepin’ on, Russia, Russia, Russia. One liar over here (D. C.) says it, the one over there (in France) thinks “Wow that’s a good scapegoat” so complains about it, so then the liar over here says, “See! Even over there too!” And so, ’round and ’round it goes, and true X-File believers (slogan: “I want to believe!”) pick up on it, and cheer and repeat. Echo, echo, in true Goebbels format, until it becomes true (to you? No? Good). Then Vault7 starts dribbling out the tools of the criminal government-directed taxpayer-funded cyber-hacking trade. Uh oh, UMBRAGE is the tool that shows how the CIA leaves evidence of, wait for it, Russians hacking! Oh, my, after that came out, Wired pointed to it, and moaned Oh, No, the perfect excuse for people to deny that the Russians hacked the elections! I mean, who else but the Russians would want to tell the world what the Royal Heir Apparent really thinks about the serfs in her fiefdom! Who else but the villain Boris would want Americans to know the truth? The shame! But the baseless Russian excuse for “letting Trump win” is now pretty much kaput, Americans just aren’t buying it. If Trump’s numbers are going down, it’s probably because of these broken promises and he’s not finding a way to push them through, and too many people are now wondering if he really meant them. And putting his voice to a wilted, meek, tiptoe of “Repeal”, and that even a false label, people aren’t so easily fooled now. But like Scott Adams predicted, the “Hitler” charge has hit the dust, Now the “Russia” charge is wilting, so they’re setting up for plan “E”. Plans A, B, C, and D were blocking the nomination, rigging the election, the Hitler theme (racist! fascist!) isn’t working, the Russian collusion thing is collapsing (with Comey and companies keeping it open just in case). Next, plan E.
Trump is crazy! Uh, just like Hitler! The shrink said it on the Tucker Carlson show! Forget the Russians, Trump is crazy! He’s got as many bats in his belfry as, Clinton! Posted in Conspiracies, Conspiracy Theory, Elections, Federal Reserve, Foreign Affairs, Freedom, Politics | Comments Off on The Russians Are Coming? Whoa! Who’s that in my video cam lookin’ down on me? This episode of changing rules in Honduras just shows the general peril of ANY government. Democracy is NOT any “better” than any other form of government. Power corrupts. Taxation is extortion by definition, no matter how many of the majority vote for it. Follow the law or go to jail. By the way, though, I read various articles on the proceedings, and they are not the end of the democracy as depicted, so much as a lot of noise and riot by a party founded by people who in power did much worse, of course. The United States’ long history is the best attempt maybe along those lines, and look where it is now. The “strong media” of the 19th century is now a sycophantic mouthpiece for more control over every piece of your life by government. The best example of this is their treatment of the champion of individual freedom in the United States in his presidential campaign, Ron Paul. But college kids loved him. He was different, and showed character by shutting down lobbyists, like Larry Abrammoff said in a Q&A on CSpan once, he was one that you could not get anything from him with offers of money. Otherwise, he said they’re more or less all for sale. Centralization of power in the United States began with the Constitution, had a false start with Alexander Hamilton’s central bank baby, which Andrew Jackson killed off, got a second wind with Abraham Lincoln, and then accelerated after the Federal Reserve Bank was created and populated with the bankers they were supposedly going to regulate for the people’s interest, and it was created after a campaign that pretended it was to stop their abuses. The Income Tax was another abuse enacted the same year. It’s an abuse because I don’t have the right to tell you how much you get to keep of the fruits of your labor and how much you have to pay me for “protection”. Even if you vote for me. Theft is theft. Or call it extortion if you must, because it depends also on how “stable” such thieves are in office. At least by a vote they have to got through pretense. Allende was voted a plurality in Chile, and when he began ruling as an economic and political tyrant, the Congress had no constitutional remedy, so they passed a resolution DEMANDING that the military stop him. Allende did not yield to diplomatic pressure, either, and a lot of that saw the (again) sycophantic controlled “strong” media cheering Allende for cutting down Anaconda copper. The media (outside Honduras) did not report the abused Allende perpetrated any more than they did Zelaya’s. But in 2009 we already had the Internet. So the only mainstream reporting during both abusive regimes was condemnatory of the moves against leftist-fascism. Think not; more centralized control is their game plan. At least that’s what they do. Some as zombies, true, but nonetheless. That’s why hope for Honduras, in my opinion, has two grounds for optimism. ONE, the fact that one of the poorest country in Latin America, and that was already saturated by violent gangs and the same demagaguery as Venezuela, Peru, Ecuador, and even Argentina and Brazil, nonetheless pushed back against the tyranny. TWO, they worked quickly to find a way to bring Honduras out of the vicious poverty swamp. They scoured the world and brought people from Chile to share how they became the first Latin American developed country. They investigated the examples of South Korea (contrast with North Korea) and Hong Kong and China’s special economic zones (that copy the HK model), Singapore, that became prosperous while their neighbors sank in the mire. The politics is noisy in Honduras right now, and the dirty laundry is now public, but it was always thus. It’s just that after 2009, they have to stay clean, at least until the sons of the Chavez-Zelaya-Castro marriage grab a majority or plurality. It was always much WORSE in fact. I have certain knowledge that many of the Congress years past were into the kinds of business that would make Al Capone blush. And that includes some of those now demanding “democracy” from the controlling coalition. Fighting over the spoils of conquest is what this is, and people must push back against any government having any power at all to loot anybody. The Internet and the Obamacare and a Controlled Net? Events are tending to consolidating into a setup for the infamous Mark of the Beast government. Everybody is using plastic, they’ve nationalized the ID already (done long ago almost everywhere outside the USA), and the Internet is a perfect vehicle for a buy and sell medium. IP6 Internet, I believe, they say anyway that it’s “more secure” than IP4. Don’t know enough about it yet to say, but “more secure” can mean anybody you transact with could identify you positively (as much as is possible). Bitcoin can get traction in the stealth side of the Internet, somewhat, but that doesn’t mean there won’t be an attempt to use it to control the entire world’s economic activity. They could even let go of the current dollar disaster, no problem, they’ve already got some of these international units in place, euro-units, whatnot. In fact, they could just criminalize all transactions done outside their scope. Lots of readers are jumping in on this and thinking there are too many problems for this to make it work. Obamacare is a good warning on that, as central planning is always eventually doomed anyway. No matter with all that stuff they’re feeding the popular mind to scare them (us) with what their secret agents will do to bad guys (“Oh, and he owns an anti-government web site”). Posted in Anarcho-Capitalism, Bible, Federal Reserve, Government, Internet, Police state, Socialism | Comments Off on The Internet and the Obamacare and a Controlled Net? The Daily Bell – Edward Snowden: Limited Hangout or a Globalist Step-Back? These guys at The Daily Bell always offer penetrating insight into the big stories that the Old Media plays up big. More often than not, there is more to the fact that it is a story in the corporate-government-media complex than meets the eye at first glance. They don’t offer these ideas as just-so, or as if they were facts. Indeed they simply say this is what it looks like to us. Free-Market Analysis: You read it here first over the weekend: Like Julian Assange and Occupy Wall Street, Edward Snowden is likely part of a larger dominant social theme, a manipulation created and supported by globalists who have created the world’s mega-surveillance state and now want to publicly enshrine it. Was Guardian ‘SpyGate’ Article Planted to Support Pending British ‘Snooper’ Law? The Guardian, which broke the initial story utilizing Snowden as a source, is part of the mainstream media. The mainstream media is controlled and globalist in its outlook. If those controlling the Guardian and other mainstream outlets didn’t want Snowden on the front page, he wouldn’t be there. False flag operations, the military calls them. Seems as though about half of the “terrorist” hits since 2001 that the FBI stopped were FBI false flag operations in the first place. But stop the presses. The Daily Bell itself promotes throughout its web pages the theme that the Internet Reformation is a big challenge to the powers that be that they expend considerable intellectual effort exposing. There is Ron Paul praising Edward Snowden and saying we need many more of them. Whether or not Snowden and Julian Assange are meant as the first phase of a Hegelian exercise, it still remains that it does expose the spying. Like Ezekiel wrote in his prophetic book, if the warning is sounded and you do nothing, it’s their fault, not yours. If you don’t sound the alarm, then it’s your fault, not theirs. These rogue actors have sounded the alarm, Ron Paul of course more effectively than most of us in the context of the current state of the world. But there is indeed something missing. We all need more Ron Paul’s all over the world. The rest of the world is none of America‘s business, meaning meddling is neither welcome or effective as a diplomatic tool. But what is more effective is communication among private individuals, which is exactly what the Internet enables. American fans of Ron Paul and the principles of liberty and respect, and individual rights, need to become more aware of international initiatives along these lines. And for comic relief, we have a comment from Donald Trump on Fox News Channel. Headline: Donald Trump calls Snowden a “grandstander”. Really? Donald Trump calling Snowden a grandstander? Hello? Get it? Really? Are you kidding me? Posted in Education, Federal Reserve, Foreign Affairs, Internet, IRS, Media, Natural rights, Police state, Ron Paul, technology, USA | Comments Off on The Daily Bell – Edward Snowden: Limited Hangout or a Globalist Step-Back? Make no mistake: The INDIVIDUAL right to bear arms is not just a constitutional right, it is a NATURAL individual right that SOME of the Founders demanded be recognized along with the other NATURAL rights recognized in the Bill of Rights as a condition for ratification. In other words, U.S. citizens to not get their right to bear arms from any constitution. They get it as a natural birth-right along with all the other individual human beings in the world, every one of them. Jews, Arabs, Gypsies, Armenians, handicapped, women, short men, tall men, ugly men and handsome, Cambodians, Chinese, ALL of us. If a heavily armed local population is a danger to so-called “community safety”, then the INDIVIDUALS that have to live in such a population has an even stronger case for their individual right to bear arms and protect themselves, including, if necessary, forming militia to defend themselves against the Great Enlightened Overlords of the Great Enlightened United Nations and other Dictators’ Clubs who believe that they have to protect the community from itself. The “leading democratic states” are exposing themselves today as ENEMIES of human rights protections and enemies of the “peaceful resolution” of conflicts. They pretend to work for the people while they are looting them by the force the guns of the armies of the law, confiscating the fruits of the labor of the people. If you don’t like it and speak out you will go to prison. Attacks against children in “gun-free” zones..
Jesus said to heal the sick, comfort the broken-hearted, set the captives free. The “fundamentalist Christian Right” have been doing this for 2,000 years WITHOUT STEALING A SINGLE DIME BY THE FORCE OF THE GUN OF THE LAW. You do NOT get ANY moral credit for sending IRS agents out by the thousands to make sure you TAKE WITHOUT SPECIFIC PERMISSION all the stuff you use for “good” things. The road to hell is paved with good intentions. The Neo-cons and “Christian Zionists” –Pharisees of this generation– indeed have left off following the Two Greatest Commandments, following Israel into denying what Jesus said: “I am the way, the truth and the life; No man cometh to the Father but by me”. Jesus said this to the same Pharisee sect that today gets special privilege in Israel –founded by godless, SECULAR and socialist Zionists, by the way. Neither the Christian Media Establishment of today, NOR the leftist Sojourner-type Establishment Christians, are following Christ’s teachings. One is into stealing from their neighbors in the name of the sacred “majority vote” for the WARfare state, the other is into stealing from their neighbors in the name of the sacred “majority vote” for the WELfare state, and the only true recipients of all this largess in the end is either the military-industrial complex on the one hand, or the government-media-corporate complex on the other. While they give out crumbs to keep the poor happy (crumbs they steal from the middle class) and cry “Let them eat cake!” in the imperial capital of D.C., they swear allegiance to both the “safety net” and the Constitution. But there is no safety net except for the winners in the wheeling and dealing in our Imperial occupiers’ capital. Along come people making off with the “Christian” label who obviously do not care to “search the Scriptures, to see if these things be so”. These are the “Christians” who see the robbery victim on the side of the road and pass by. Instead of carrying the poor guy to the inn and promising “I” will repay like the Good Samaritan, they rob the next guy to come along to pay for the first guy. Good innovators with good ideas and good business ethics like Tucker are left in ruins because they expose the whole sordid fraud of “welfare”. While the cold-hearted “religious right” pours out tithes and of their abundance to get there first after Hurricane Katrina and Hurricane Andrew and around the world to help the helpless, the oh-so-warm-hearted caring “liberals” are very liberal with their NEIGHBOR’s fruits of somebody Else’s labor, stealing as much as it takes to “help” rich politicians get richer off the backs of the poor man’s vote. They want even more –like Ron Paul said it– so they can “steal from the poor in rich countries to give to the rich in poor countries”, and call it “helping”. And until Ron Paul, not many people paid attention to the money changers who are committing Grand Theft Inflation, robbing the resources right out from under the housewife’s grocery money to spend it on their own interests. If you can only get your money by stealing it in taxes (taking without asking) or by printing money (exchanging your dollar’s value for a dollar of less value without having to bother getting shot back like the BURGLAR they are), then you are NOT obeying Christ, you are leaving the poor guy on the side of the road for a good Christian SAMARITAN like in the story Jesus told or David Livingston or Mother Theresa to help undo your damage to the poor. There was a news conference by the targets of the IRS witch-hunt. Make no mistake that’s what it was. It’s not just the keyword searches for putting the applications behind the rest of them. There were some that were not from any “tea party” or “patriot” names, but “American Grizzlies”? And how about that keyword “constitution”? Are neutral officials –ahem, “neutral”– somehow allergic to the United States Constitution? How about the groups with the name “Christian” in them? The story of Gary Johnston, a retired police officer from Kingston, Tenn., seemed to typify the abuse suffered by many rank-and-file tea party members at the hands of the IRS. Johnston told WND he put together a small tea party group in 2009 and had no plans to file for tax-exempt status as a 501(c)(4) organization. But the IRS told him he had to do it. So, he first filled out a 19 page questionnaire in March of 2010. In August, the IRS sent him another form with 22 more questions, and embedded within those were another 60 questions. “A lot of the questions struck me as strange,” Johnston said. What sort of personal information did the IRS want to know? Did they ask you anything about reading material? She advised Johnston not to respond to many of the questions and not provide the IRS with much of the material it had requested. The IRS then sent him a form with another 40 questions, including some of the same questions he had refused to answer earlier. The witch hunt was executed by the IRS against the targeted groups. Why did they think they could get away with this? The organization said it had submitted sample radio programs after the IRS had demanded them, although none was aired during an election year. “It was the opinion of Family Talk Action’s legal counsel that these samples were not only 501(c)(4) qualified but 501(c)(3) qualified,” the statement said. “Family Talk Action’s legal counsel had never heard an IRS agent express biased statements like those he heard during the March 19 call. He also felt that the this agent did not understand the difference between 501(c)(3) and 501(c)(4) entities,” the report said. Not educational because it “doesn’t present all views”? Oh yeah? How about all the multitude of 501c4 AND 501(c)(3) entities it routinely approves that only present leftist and anti-Christian views, like Media Matters and others? Oh, and what did the Big “O” say he’s going to do about it? He’s going to put a stop to this because it’s important that Americans “understand and believe that the IRS” is fair. Oh yeah, except this episode shows it’s NOT fair. How about it’s important to follow the Supreme Law of the Land, the Constitution? So who is he going to put in jail over this for abuse of power? Anybody? Look, does the Socialist Workers Party get the third degree grilling, send us all of your emails you ever got or sent? What an uproar that would be right? How about from the unions? It’s not a “small cadre” of a couple of “rogue agents”. It looks like it was ALL the conservative groups that had any of those “suspicious” keywords in their names! According to Fox News, an internal timeline by the inspector general’s office revealed the IRS began looking at tea party and “patriot” groups as early as 2010, shortly after Obamacare was passed. In early 2012, the IRS expanded the list even further to include groups that were educating people on the Constitution and Bill of Rights and involved in limiting/expanding government. Gardner told WND that among the multiple conservative groups targeted by the IRS was at least one group from Colorado. The group, which is asking that its name be kept private for now, applied for 501(c)(4) status and had its application illegally released to the public during the application process, which is a clear violation of federal law. Yeah, just apologize and that’s it? We put a muzzle on the voices of tens of thousands of Americans, and tilted the election to an administration that expands the Patriot Act, confiscates two months of emails and reports from a press organization (a leftist one even!) to catch a whistleblower supposedly, tells the man in charge in Tripoli second to the late Ambassador he’d better muzzle himself instead of testify to events, covers up the truth about events that left four people to die in an attack that could have been avoided. And refuses to give up the prerogative (it’s not a “right”) to kill any American the President fingers as a threat. And under whom even the Pentagon is now claiming the power to kill Americans and control them under certain conditions. And nobody goes to jail? Watergate was a LOT less than all this, and people went to prison. Hello? And Holder, after treating the Congress with such contempt and stonewalling on Fast and Furious, and to this day refusing to release relevant documents, and even bald-faced punishing the whistleblowers of Fast and Furious, he rebukes Congress for incivility and lack of respect?! (BREITBART) The IRS scandal of targeting tea party or conservative organizations grew deeper Wednesday with the revelation that the agency denied tax-exempt status to a pro-life organization because of its hypothetical opposition of Planned Parenthood. The Thomas Moore Society, a public interest law firm announced that one of their clients was told that their approval as a non-profit was conditioned on a commitment not to protest outside Planned Parenthood abortion clinics. CAIRO — In the month before attackers stormed U.S. facilities in Benghazi and killed four Americans, U.S. Ambassador Christopher Stevens twice turned down offers of security assistance made by the senior U.S. military official in the region in response to concerns that Stevens had raised in a still secret memorandum, two government officials told McClatchy. There is something else going on there. Presuming, just for the sake of argument, that it’s true, the big question is indeed WHY? The Embassy had just reported that they could NOT defend the compound in Benghazi, and they needed “additional security upgrades”. Note, this is some anonymous somebody’s recollection of somebody else’s phone call. Stevens can no longer tell his side of that phone call, ey? Why Stevens, who died of smoke inhalation in the first of two attacks that took place late Sept. 11 and early Sept. 12, 2012, would turn down the offers remains unclear. The deteriorating security situation in Benghazi had been the subject of a meeting that embassy officials held Aug. 15, where they concluded they could not defend the U.S. diplomatic compound in Benghazi. The next day, the embassy drafted a cable outlining the dire circumstances and saying it would spell out what it needed in a separate cable. “In light of the uncertain security environment, US Mission Benghazi will submit specific requests to US Embassy Tripoli for additional physical security upgrades and staffing needs by separate cover,” said the cable, which was first reported by Fox News. Senator Lindsay Graham is not my favorite politician, being an advocate as he is for shredding the US Constitution. But note that the Embassy had made repeated security requests and were denied, not by the military brass, but by the State Department in Washington, D.C.
Maybe this is the military brass doing its own CYA “not my fault” public relations effort, true or not. I can believe it, of course. But there are more questions raised in this McClatchy report than answers. (1) WHO GAVE THE ORDER to the military security team in Tripoli to stand down instead of moving to help defend the Americans under attack? (2) WHO in the D.C. State Department hierarchy turned down the request for better security in Libya? How high did that decision go? How high does it usually go? (3) AT THIS POINT, what difference does it make? (This has been answered but it’s good to keep it in mind). (4) If the important thing is to make sure it doesn’t happen again, then why is the Administration trying to make sure the people they work for don’t even know what happened? (6) The acting head of the diplomatic mission in Libya described the situation to the Secretary of State, we now know, finally from his own mouth to Congress. So WHY did Clinton, and Susan Rice (who reports to her), and don’t forget OBAMA himself, repeat so often that this was a spontaneous demonstration and blame a VIDEO? (7) WHY IS SOMEBODY WHO MADE A VIDEO STILL IN PRISON? DID SOMEBODY SUSPEND THE CONSTITUTION? Good insight, Andrew. If ICANN is set up to enforce a government monopoly controlling domain names, which it is like Kinsella says, then the way Kinsella seems to be coming down on this is self-contradictory, as is the position of the ronpaul.com supporters. I heard Kinsella on the Adam Koresh youtube channel interview about this. After explaining how it is a government-mandated monopoly system under the cover of a quasi-private quasi-official organization like the Fed, and how there are some 30 government officials on the Board of it, he then goes on to refer to Ron Paul‘s actions in this matter as a taking, as if it stood in a vacuum outside of a government-enforced monopoly over domain assignments! The Internet domain name claim system is LIKE FAKE FIAT FED CURRENCY. Use this or use nothing! 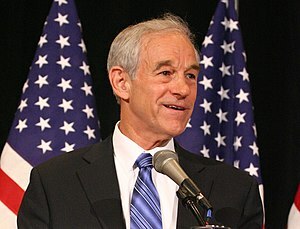 If the government had stayed out of it, if there were no trademark law, and no ICANN rule-making body, then an interconnecting network of networks could have grown organically, Ron Paul would own his name and there would grow from the free market a way to see what he says without the ambiguities of who claims a monopoly right on the name first. That’s my opinion for a hypothetical obviously. But like I have said elsewhere, get another perspective. As one who lost by two days of thinking about grabbing the URL for http://www.miami.com (arggh), just imagine the ronpaul.com guys when they went looking for it. They could not BELIEVE their outrageous good luck in finding out that they got there before Ron Paul himself. Grab it quick, Jack, before Ron Paul figures it out! Now they whine and complain that they want compensation for being first grabber of a trademark-law-guaranteed monopoly. Either way this goes, I lean to the same Kinsella view of copyright, patent, and trademark laws. But it is blatantly self-contradictory to say you think trademark law is theft, and then support the monopoly control over it that he says he figures will go to the current “owners” of the name. He seems to agree that the claim is an attempt to seize private property, but he did hesitate a bit when he was asked that, directly by Koresh. But it is property with conditions. Under any “natural law” that might be analogous to trademark law considered here, Ron Paul has a higher claim on the political implications of his name than anybody. They rode Ron Paul’s name and his fame to their own claim. Ron Paul a hypothetical plumber in Minnesota, could make a credible claim to the name factor that is being used to criticize the action, but that’s irrelevant here because the present “owners” of the URL do not carry that name except as a government-created fiction. And Ron Paul is NOT “filing suit”, he is filing a claim. This is an administrative body but it is an arbitration process besides that. ARE WE DISAPPOINTED WITH RON PAUL JUST BECAUSE HE USES FEDERAL RESERVE NOTES WHEN HE BUYS GAS??!! Or because he had to use the two-party duopoly to make his point and leave his legacy? You think his usurping the Establishment Republicans’ “rightful” ownership of the party deserves any more than a spitting glance? Do YOU pay for your gas with fake counterfeit money? I think this whole thing has been blown out of proportion by the savvy loud and fast blast of propaganda that ronpaul.com “owners” executed masterfully and immediately. They claim that they offered it free to Ron Paul without compensation, but this is a moot claim, since they obviously did not mean it. They wanted something in return, or otherwise they would just let him have it. Without monetary compensation, maybe, but they wanted something that, in my opinion, when we know exactly what it supposedly was, was something that was of convertible value. I suspect. Again, we do not fault Ron Paul for using what he calls counterfeit money to negotiate for the fruits of his labor at the supermarket. Nor do we fault ourselves. It is simply does not cut so clearly in the present monopoly franchisee’s favor. We shall see how it falls, but the biggest problem is that this infighting over this issue is distracting attention from the bigger issues of the economic and social disaster fast coming, and all the issues of Ron Paul’s message. I deleted myself out of Facebook sometime ago already, but if you have a presence there, you might want to refer to the web page to spread the word. It’s a good conversation starter on the subject of liberty too..
I’m starting a monthly effort to generate more awareness of the Federal Reserve system, alternative currencies, sound money, etc. and if you’re interested I would like your help. The idea is every fifth of the month I will post information each hour to this Facebook page: https://www.facebook.com/FedAwarenessDay (please like this page!) so that those who are following the page can easily share the information and (hopefully) reach a large amount of people who still do not understand the Federal Reserve system and how it operates. If you know of something (a video, article, image) that should be shared on the 5th I hope you’ll post it here. Any questions you might have and/or ideas for improving the effort are also greatly appreciated. Thank you for your consideration and thanks in advance for your participation.